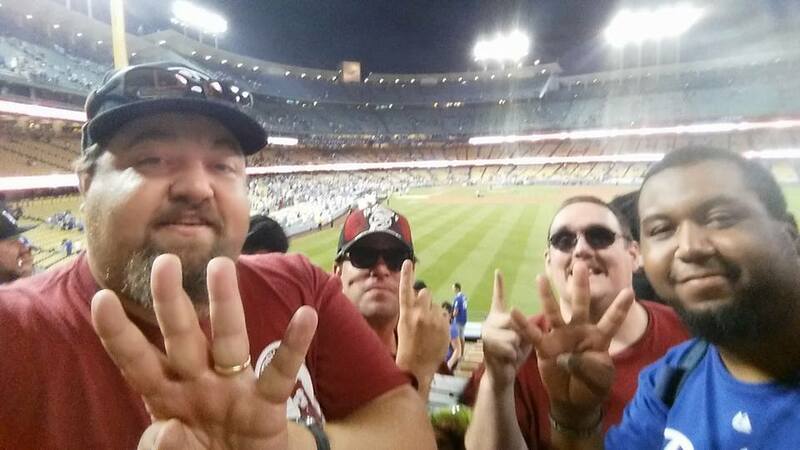 224 Games In 183 Days MLB Trip in 2015 Wrap Up: Historical Trip Ends With A Tripleheader! 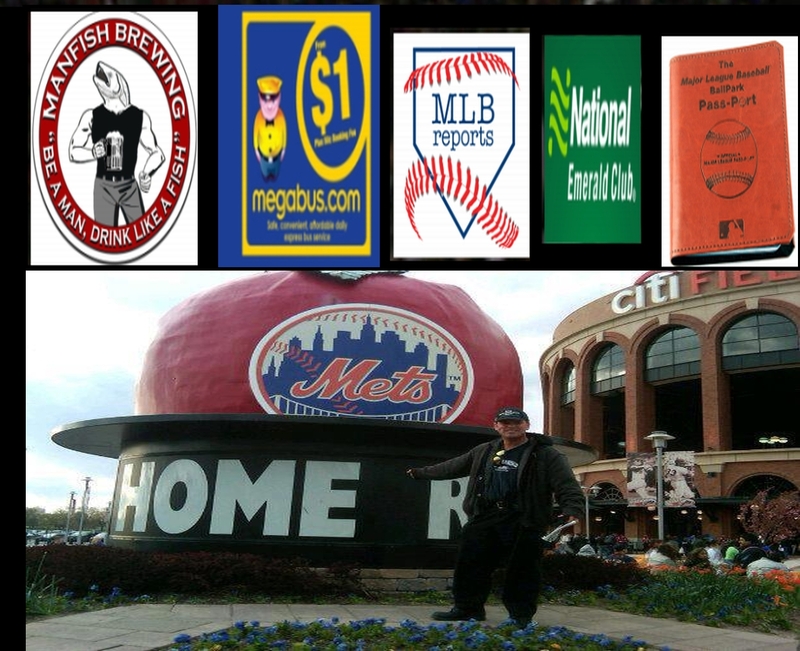 2015 MLB Trip Sponsors: Man Fish Brewery, Megabus.com, MLB Reports, National Car Rental, MLB Ball Park Pass-Port. The GOAL: 183 Straight Days (every single day at least 1 gm) Of ALL 30 MLB Parks Trip In 2015 (224 Games) view full year schedule. So I ended up at 224 Games after a flurry of maneuvers and last second scheduling. Here is how I arrived at that mark. Making every game on my schedule was always a goal, and for the year, there was only 3 missed games and all were made up at the park in which I witnessed. 223 Games In 183 Days MLB Trip For 2015: Hoodini Act Part 2 + Just 10 Days Left! The GOAL: 183 Straight Days (every single day at least 1 gm) Of ALL 30 MLB Parks Trip In 2015 (223 Games) view full year schedule. I am right in the middle of the most torrid stretch of games I have ever gone to. Since 15 days ago on Friday night (Sept.10) – I have attended 9 doubleheaders in 15 days. I have 2 more twinbills to plow through on Sunday, Sept.27/2015 and Monday Sept.28/2015. This will make 27 Games in 16 total days. The GOAL: 183 Straight Days (every single day at least 1 gm) Of ALL 30 MLB Parks Trip In 2015 (221 Games) view full year schedule. It was a week in which I had many scares for weather causing me to miss a game I had on the schedule. Lets go to the Thursday Sept 10th in Philly, that did become a postponed affair. Luckily for yours truly – they rescheduled the game for the next night at Citizens Bank Park. It did cause me to take a game off the list in Baltimore at Camden, but was a no-brainer considering CBP is the closest park to home base in Sicklerville, N.J. There is 29 days left of the regular season. This is starting to hit home with me. Luckily, I still have 39 Games left. So it finally happened after 174 Games into the trip, and 148 Days overall. I saw a no-hitter tossed by Jake Arrieta in my only game at Dodger Stadium this year. It was one day after my birthday party in Phoenix yesterday. It also marked the 375th game I have been to in the MLB ever. The GOAL: 183 Straight Days (every single day at least 1 gm) Of ALL 30 MLB Parks Trip In 2015 (217 Games) view full year schedule. So there are ups and downs in this trip as I have ventured out on this journey. It is not just the baseball games that I am going to….I am trying to fully heal my body and brain after having a bad accident years ago where I was hit and run by a guy. I have come back 97% to what I need to be, but every once in a while that 3% seeps into the foray. I had one of those events yesterday. Over the weekend, we hosted 35 ballpark chasers at my friend Ken Lee’s house in Renton. This is virtually every extreme ballpark guru in the group across the nation, with the exception of a few omissions. Ken and I sponsored a barbeque at his house in Renton, WA, USA (Home of Manfish Brewing) – and because of my free car rental days, I was able to secure transportation for all who needed shuttling around Saturday, Aug.22/2015. I also drove for 7 hours around the city picking up the top ‘ballpark chasers’ of the country. It was a grand old-time, and all of us had the time of our lives, however I probably kicked up the adrenaline too much, and Monday was a big let down. I am feeling much better again at today. The 2nd Annual Ballpark Chasers Meetup in Seattle was a resounding success, and we set the bar high for future venue’s hosting the event in future years. 217 Games In 183 Days MLB Year Long Road Trip – Knocking Down The First 162 Games!! Completing a doubleheader today at Yankee Stadium – and then Citizens Bank Ball Park in Philly puts me at the 162 game mark. On the set of Fox 9 wishing I could wear my shades to combat bright lighting. The GOAL: 183 Straight Days (every single day at least 1 gm) Of ALL 30 MLB Parks Trip In 2015 (215 – 220 Games) view full year schedule. Where I am headed to next? I have two straight nights of Megabus rides, sandwiched between a matinee at Target Field, with two big TV and radio interviews lined up. Free Car Rental days (have used 34/46 free rental days. Miles traveled thus far by all modes (57000 Miles). Before you say that is a lot, I did that many by air in my 2012 World Record Streak. Home team record is now astoundingly good at 87 – 66 (.569 win %). Not bad when you consider that CBP in Philadelphia has the most games watched so far. 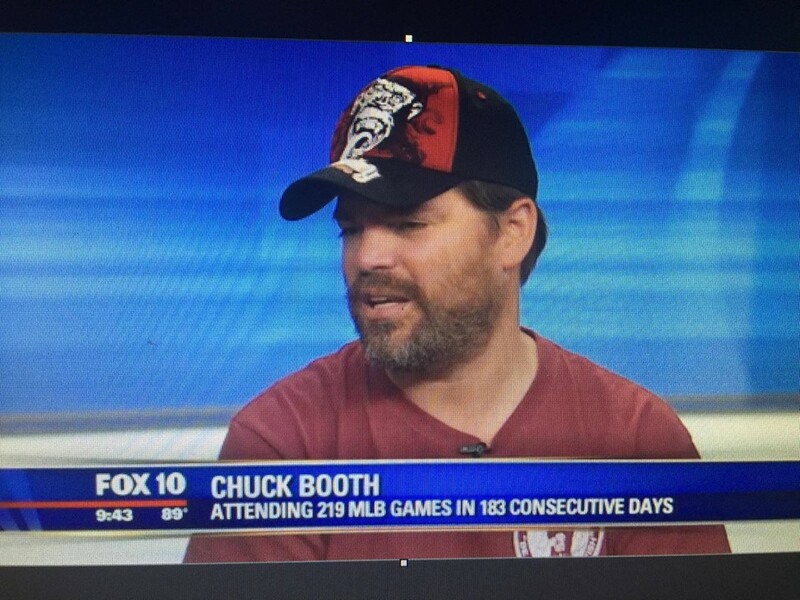 Makes 154 Games in 130 Days through Aug.12 2015 – featuring 29 Doubleheaders, 1 missed and 1 madeup doubleheader, and one outright miss (Apr.07, that was cancelled and rescheduled for July.07, 2015, in which I attended anyways. There was also a four day break for the ALL – Star Break). I have 63 Games Left in 53 Days. 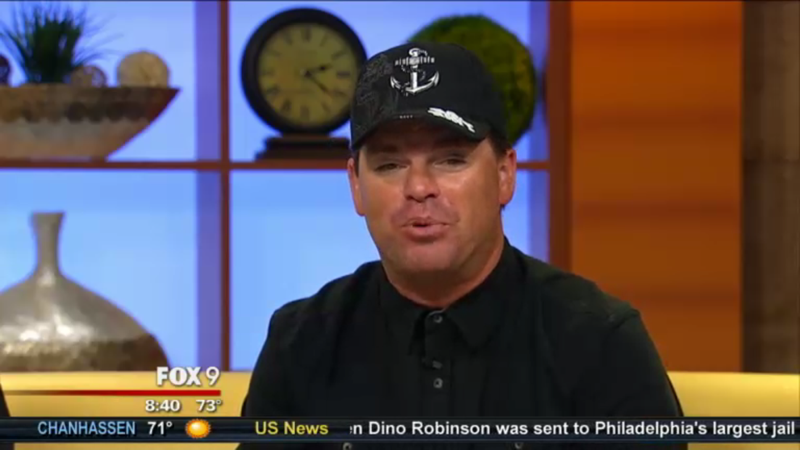 June Interview on Fox 10. 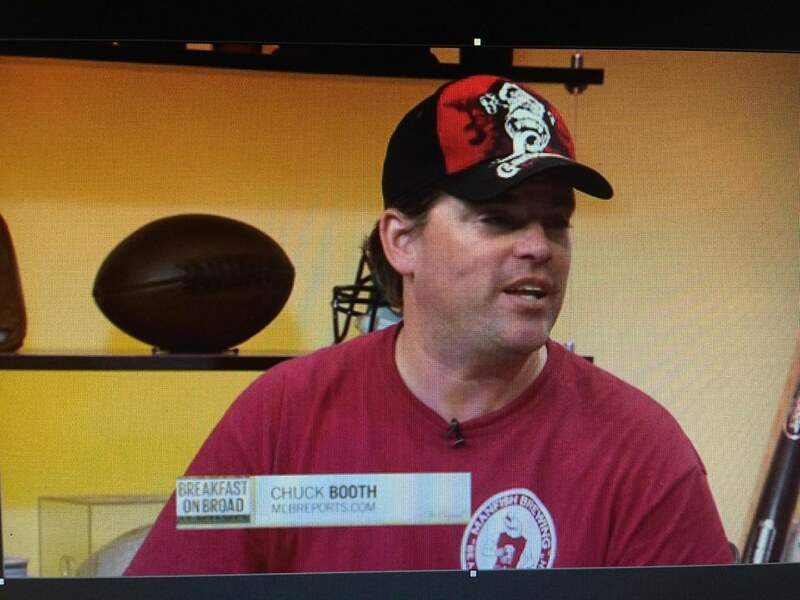 Interview on CSN Philly during the month of July. The GOAL: 183 Straight Days (every single day at least 1 gm) Of ALL 30 MLB Parks Trip In 2015 (216 Games) view full year schedule. 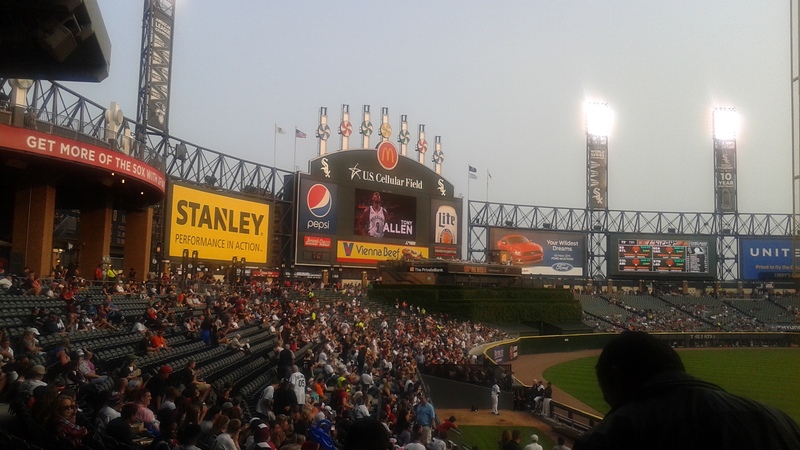 US Cellular Field 7:10, White Sox vs Angels (5/6 games at US Cellular Field this year). a 30 hour travel sector tested my limit and sanity once again. Overall it was not a very good week of execution on either my part, or parties that were helping me on the voyages. I am hoping that having my car with me for the majority will help clean that up in the next 10 days in the Midwest, Toronto and Baltimore, before I hit the West Coast for an 11 day road swing. 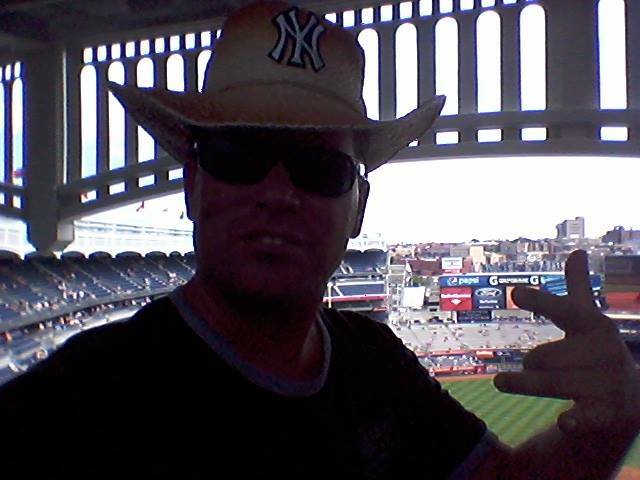 At least I made it to Yankee Stadium early enough to receive this killer cowboy hat. Unfortunately I will be selling this on EBAY to help pay for some of the fiasco that was this week. I started out Friday morning (Aug.07, 2015) with much swagger. I began the day with an exciting interview opportunity in which I nailed for a potential paying gig surrounding MLB. Since I couldn’t take my car to a Park and Ride in Sicklerville, N.J. (since I would be gone for 40 hours on Friday and Saturday), I walked 2 miles to my public bus – in order to make the connecting transport to Philadelphia Amtrak 30th Station. I did not want to risk a tow charge for using the Park N ride service for too long. I ate a heavy helping of Ramen noodles before leaving. Hey, you gotta save dough where you can. My friend Gary Herman gave me a free coupon for a Chic – fil-a sandwich earlier this week – which I capitalized on since it was 800 feet from my public bus Friday..
NJ Transit took me to the Lindenwold PATCO Speedline. I have taken this method all week. It costs just $3 for a one way maneuver into downtown Philly. If I am headed to New York – they have a Megabus pickup location at Philly independence Hall. It only takes 25 minutes. Today was not one of those days. Trips to Washington are picked up from Amtrak 30th Station only. It is still a $3 move for me because it falls within the free interloop zone for light rail trips out of Jefferson Station. (Right across from the Greyhound Station on Filbert Street). 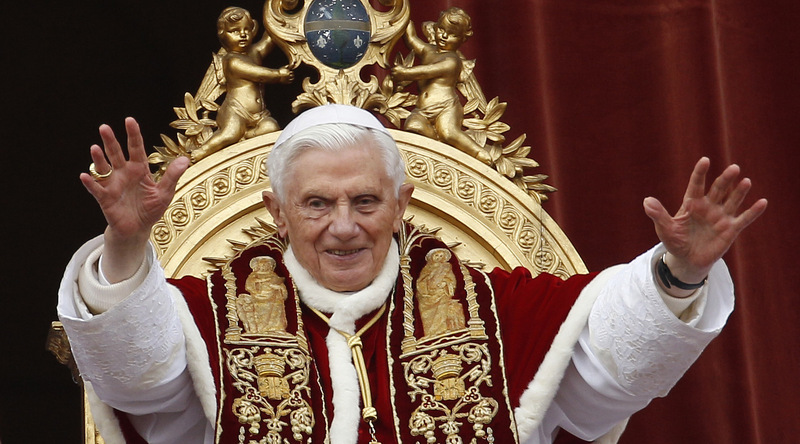 Pope Benedict XVI greets the crowd after delivering his Christmas message “urbi et orbi” (to the city and the world) from the central balcony of St. Peter’s Basilica at the Vatican Dec. 25. (CNS photo/Paul Haring) (Dec. 25, 2012). He will be bringing his talents to Philadelphia, effectively shutting down traffic in all directions during late September, causing this ballpark chaser to scramble some more. Here is a new one for the books.. Extra costs and maneuvers needed to be pulled off because The Pope Is Coming to Philly Sept.24 – Sept.27. The city of Philly will not run busses through downtown like I needed them too. So instead if weaving around on $1 bus fares on Megabus, I will have to flip cities between New York and Washington instead. They call them the dog days of summer, and they are right to an extent. Tonight’s win for New York marked the 146th game I have seen this year in 124 Days. There is 71 games left in 59 days left. I am going to Washington for the next three days, but also have a game in the Bronx on Saturday afternoon, before catching am Amtrak train to the District. Maybe it was because of a tough travel day on Monday, but I never even realized I could have just stayed in Philly for a game once my initial plans were derailed to Washington. In this whole year trip I have over 300 reservation numbers to keep track of. On this Tuesday I made a rookie mistake. All the way back in March I switched out a bus trip to Washington from the Amtrak Station in Philadelphia. The idea back then was to stay overnight in the District Monday Aug.03, 2015. 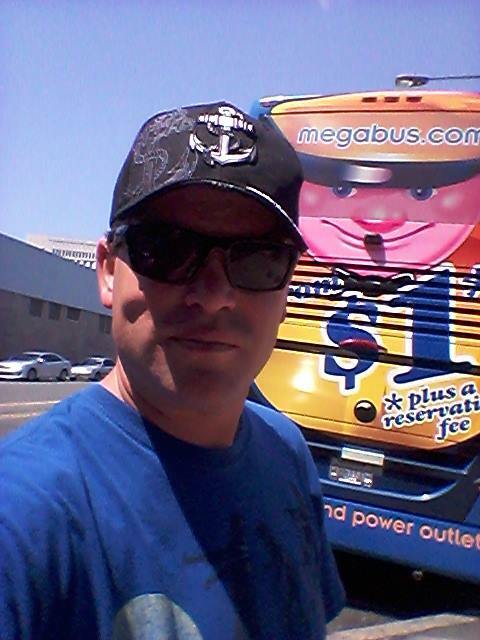 It is kind of weird the only time I have posed for a picture in front of a Megabus was for a reservation I had that wasn’t even valid anymore. I sit here humbled that I made it this far in my journey. 4 years ago at this time, I was not in a good place. I was working, going home and trying to fend off headaches, dizziness and any loud sounds. The government in my home town province of Canada, was not helping me with my claim versus a 2010 accident where I was hit and ran by a driver of a big truck. I would later hire a personal injury and take them to task. These were the dark days of depression one suffers from repeated concussions. It even went to other parts of my body like arms and shoulders – tingling from stress. So having said that, one of the things I did during this stretch was still capitalize my best skills with what was given to me. I turned to professional handicapping and earning Air Miles through a google search engine. The week started off in New York City at 12:01 AM pn Monday morning, I drove back to Sicklerville, NJ, completing 26 days where I drove almost 17000 Miles. It was a crazy stretch of travel, but had a nice ending. Monday afternoon came around the bend, and I was on my way to Baltimore. The idea was to come back to Sicklerville every 2 nights, while blogging the other night at Starbucks in between. The tolls on this roundtrip run around $30. As soon as I made it to Baltimore, I stopped off at the White Marsh area (Exit 67) on the I – 95. There is a way to avoid the last $4 toll towards the ballpark by taking the 40 West. Needless to say I am going to triumph the company Megabus here in this article. For those that don’t know the story, they saved my trip from about a 185 games to about 215 – 220 games early in the season. I bought half of my journey back then for $1 each, and did the same thing halfway through this odyssey. With me being handicapped as a Canadian – for a plunging Canadian Dollar, this help me off set this. Back in mid 2014, I saw the trend of the Loonie heading south, so I invested as much savings as I could – stuffing my American $ bank account. So while I may have a tough time traveling to the United States past this year, I will make it through my trip. In my original design of this concept, I planned to travel a lot of games on the Eastern Seaboard by car. As I like to say “Gucci this, you see the price of that s-it! So far, I have only made a few trips via my own vehicle. The only drawback was I wanted to see 20 MLB games at Fenway, and now that total is done at 6 parks. Anyways, Megabus created a whole new scope of savings I could use for Baltimore, Washington and the New York teams. Being stationed in Philly is the middle ground between all – and the perfect conduit. This is the reason I am at 33 games for Nats Park and 20 for Camden Yards. Coupled with Stub Hub cheap tickets, and you get the idea on how I have saved money. I wrote a massive article on the Megabus company, and they actually sought out me as a potential partner – combining efforts to make this trip a media whirlwind. Having a “PR” guy from the 3rd biggest Transportation in America bodes well for having requests come back. By the end of the year, I will have 100 interviews done for this trip in all forms of social media. This has been a great partnership, and I hope to work with them in the future. 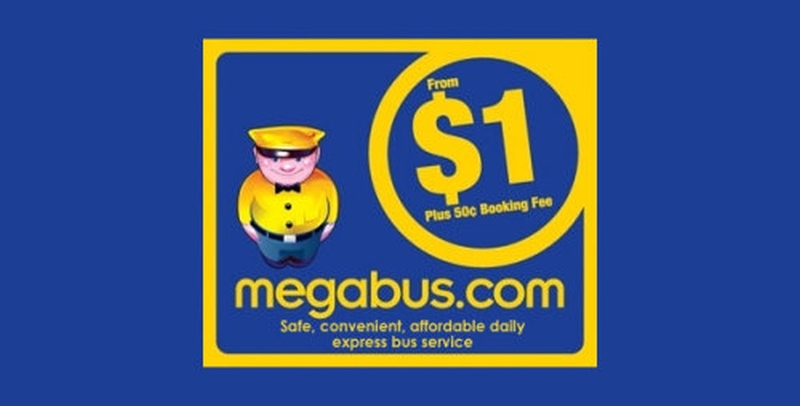 megabus allows you to switch all itineraries (whether it is one journey or 20, for a $1 fee to trade in for other fares.) I traded 20 trips – not to be used for $27 credit towards a new fare that was a peak trip. It cost me just $3.00 to pull off the maneuver after a small booking fee was added. These guys also don’t require paper tickets (although you can use a computer printout of your reservation.